In January 2018, I set out to complete a 52 week art challenge. It actually took me closer to 62 weeks, but to be fair, I also made a new human at the same time, so I’m cutting myself some slack. I have a lot to say about the experience. What follows is real and honest and, well, quite lengthy. I feel like an accomplishment like this deserves a proper written recap, but if you’re just here for the pics, that’s totally fine. Keep scrolling, you beautiful visual learner, you. I get you. But if you might relate to any of these topics: miscarriage, anxiety, depression, childbirth, new parenthood and creativity in the face of any of those things, then scroll a little slower. However fast you scroll, thank you for being here. I was planning on changing up the medium each week, which would give me some freedom within the confines of the circle to get creative and experiment with new tools and styles. That third rule? Didn’t last long. Maybe two weeks. I forgave myself for that, but just kept going. Yes, I did lift that term from a children’s book, The Pout-Pout Fish. In March of 2017, I found myself at the bottom of a pretty scary pit of anxiety and depression. The existential crisis kind. You know. Your classic “why am I alive?” purposelessness combined with your average “what happens when you die?” obsession tossed with your “oh crap, I or any of my loved ones could die at any moment” breed of anxiety. I was able to claw my way out of that awful Upside Down with the help of my husband, parents, family, friends, doctors, medication, renewed and revised faith, and hours and hours of listening to and reading stories about people who’ve gone through similarly and even more difficult things. I haven’t been back to that dark place since then, but sometimes I feel a twinge of it, and when I start to feel some of those feels start to feel their way back in and carve pathways in my brain, I turn to a vault of strategies I’ve collected to keep those vibes away. Long daily walks help a lot. Gratitude journaling, eating healthy, giving back or volunteering in some way. Working with my hands and making art is another atop that list. My husband, Keith, and I were still trying to get pregnant after three miscarriages, including an ectopic pregnancy and one fallopian tube removal. Getting pregnant is one of those things that you can try to do but you can’t control at all beyond, um, a little extra effort and maybe some careful timing. I needed something to focus on to allow me to let go of that uncontrollable goal. Something actionable, something I could control, something to take up the space in my brain that was obsessing over fertile windows. Now, I’m not saying this will work for you, so please don’t try this and then ask for your money back, but, it totally worked. As soon as I let go and threw my energies elsewhere, it happened. I learned I was expecting about a month into the project. I even think it happened about the same week that I found my medium, because I specifically remember a certain flush to my cheeks while I carved my first piece. If that isn’t some kind of weird magical hand-carved sign from the universe, I don’t know what is. My husband is an incredibly talented maker of photographs. In 2017 he was awarded a grant from the Genesee Valley Council on the Arts and throughout the course of the year, created a truly remarkable collection of photographs of lesser known views in the great nearby Letchworth State Park. Honestly, as an artist myself, I was a little envious of the opportunity, but more so completely inspired and in awe of the astounding body of work he created. I helped him put up a show at the culmination of the project and it was a huge point of pride for us both. I thought about applying for a similar grant, but I didn’t have much of a portfolio beyond my professional graphic design work and certainly no unique personal style or anything of note to go on. But that didn’t mean I couldn’t just do my own self-imposed year-long project anyway! So I did! Keith had just built this huge body of beautiful work capturing a place that literally lights up his soul. I was so inspired by the process and the end result - I wanted that too. Going into this, I had done some handlettering before. I wasn’t great at it, but I always had fun in the process. Four weeks into the project, I took a woodcut printmaking class at the Rochester Brainery with my mom as her birthday present. I had sketched out my fifth circular quote (John Muir’s “Into the forest I go, to lose my mind and find my soul”) for this class but realized I’d need to mirror the words in order to make a print. I decided to go with a simpler design that night. It turned out that I liked the carved wood bit better than the print that resulted from it, so I decided the medium I’d use for my fifth quote would be carved wood. I made that first 11.25 inch by 11.25 inch piece, framed roughly with 1.5 inch pallet wood and I knew I had arrived. I had found my form. I remember sitting and carving that first one. I was so excited to see how it would turn out that I lost all sense of time until it was finished. It hurt my neck from looking down for so long, but it felt like magic watching the letters appear with each chip of wood removed. I was hooked. I work for a pretty rad marketing agency called Article Group. I spend my days working with great people to build huge keynote presentations for massive companies like Amazon and Google. It’s all digital, all screen-based, and super extra pixel-y. Within that work, I sometimes get a chance to make something with my hands - whether it’s to scribble a heading for a slide or draw some icons by hand - and I find that those opportunities to make things with my hands fire me up. Those are the kinds of things I’ll do late into the night without complaint. I found that making things by hand outside of my day job and away from the computer screen refreshed my creativity and allowed me to return into the land of pixels and slides with new ideas and fresh focus. Though they did not make it into wood, they still deserve an honorable mention. That first one kicked the whole thing off. That second one there is actually drawn 3 feet in diameter on a chalkboard wall in my house, and is one of my most favorite quotes. I will probably revisit it in wood someday when I get a chance. The third, a solid Harry Potter quote about the pointlessness of worry. And that fourth one is the very last line from the finale of The Office featuring my take on Pam’s stapler painting. Maybe one day I’ll make a detailed process video, but for now, there you have the basic workflow. On to the output! Here they are, all 52 lined up in a row. Click on an image for commentary and then if you’re so inclined, check out the postmortem section for some fun facts and my top 8. Kinda just like MySpace. It feels really good to see these all together like this. I feel like my compositions got stronger and more interesting with each passing week. I find it quite interesting that this project coincided with my transformation from woman to mother. I often chose quotes based on how I was feeling that week, or chose something that I needed to meditate on to get me through something particularly difficult. Now I’ll get to look back at this and see what I was feeling and read the words that were there to comfort me during this period of intense change and adaptation. Super cool memento. What follows is a selection of quotes that helped me work through some pregnancy things, and then I’ll talk about some quotes that helped me (and are still helping me) work through some new motherhood things. #16 - One day a time. The first time that we were pregnant, I let myself get way too excited. I planned out the nursery and made a list of names and spent all my time daydreaming about what the future would hold. Classic counting-your-chickens-before-they-hatch situation. I went in for my first ultrasound in January, ready to hear a tiny heartbeat, but there was nothing. Just a quiet empty womb. I sobbed for days and days, grieving not only the loss of that little embryo, but the foiling of all those plans I had made. By this time, the fourth time, I had learned not to make plans. We referred to the little one as “hypothetical baby” for a solid 20 weeks before we allowed ourselves to act like it was really happening. This time, I took it one day at a time. Each day that I woke up, pregnant still, was one more day under my (tightening) belt. This project kept me occupied and away from scrolling baby room ideas on Pinterest. #26 - Brave, grateful, and kind. I could tell with this pregnancy that I had grown up quite a bit in the last couple of years because I spent a lot more time daydreaming about what I wanted to teach my child instead of what I wanted my child’s bedroom to look like. (Well, actually, to be fair, this was made to decorate my child’s bedroom…) This is the idea: I plan to ask of my child (and of myself, actually) these three basic questions: How were you brave today? What were you grateful for today? Who or what were you kind to today? And then I want to allow them the space and the grace to say “Actually, I was unkind today...” or “I was not brave today when...” so that they can let it go, air it out and try again the next day. This is my most favorite composition and carving - the color, the frame, the forms - came together in just the right way. Fun fact: I also chose the accent color on this little here site of mine because of this one. #31 - Que sera, sera. I used to joke when I was younger that I hoped that by the time I had kids, they’d have figured out a way for a woman to be unconscious for her whole pregnancy and then just wake up with a baby in her arms. I was very, very afraid of childbirth. For most of this pregnancy, I was still very, very afraid of childbirth and whenever I’d get anxious thinking about it, I would push it out of my mind and say “I don’t have to think about that today.” Until, I did have to start thinking about it. And making a birth plan. And packing a go bag. The more I read and learned, the more I realized that this was something I could not control, just like getting pregnant in the first place, and so I let go. I let go and decided all I could do was show up. And that helped. My labor was long and difficult and though I wanted to, I couldn’t do it without an epidural. But, what happened happened. Oh, that works in the past tense, too! Que paso paso. Everyone warned us but nothing can truly prepare you for the massive lifestyle change of new parenthood. Even though this was something we’d hoped for now for years, we were shocked by how hard and sometimes sad it was at the very beginning. I think I’m still struggling with the fact that my time is no longer my own. Don’t get me wrong, I am incredibly grateful to have a healthy little baby to hold. Sometimes I just sit and stare at my daughter’s face and marvel at the miracle that she is. But I also sometimes miss really simple things, like being able to freely walk out of the house at any time of day to go to the park with my dog. Now I have to borrow time from my husband to do anything, and vice versa. Here are a few quotes that have been helping me come to terms with my new very wonderful albeit very exhausting reality. #35 - This moment is more precious than you think. The first couple of weeks after we brought Rowan home were both intensely beautiful and intensely difficult. Keith and I became a team instantly; he would flit around the house cleaning and straightening and diaper changing while I learned how to nurse and healed from a human exiting me. (Is that too graphic? I don’t care, it’s true, I’m leaving it.) We were somehow exhausted and exhilarated at the same time. I was working through some baby blues when this thought crossed my consciousness (admittedly, by way of a greeting card at Wegmans) and it gave me pause. I already miss when she would doze off eating and then fall asleep snuggled on my chest. I miss her goofy little newborn faces and I miss cradling her like a football and dancing around the kitchen with her. These little moments were way more precious than I knew at the time. 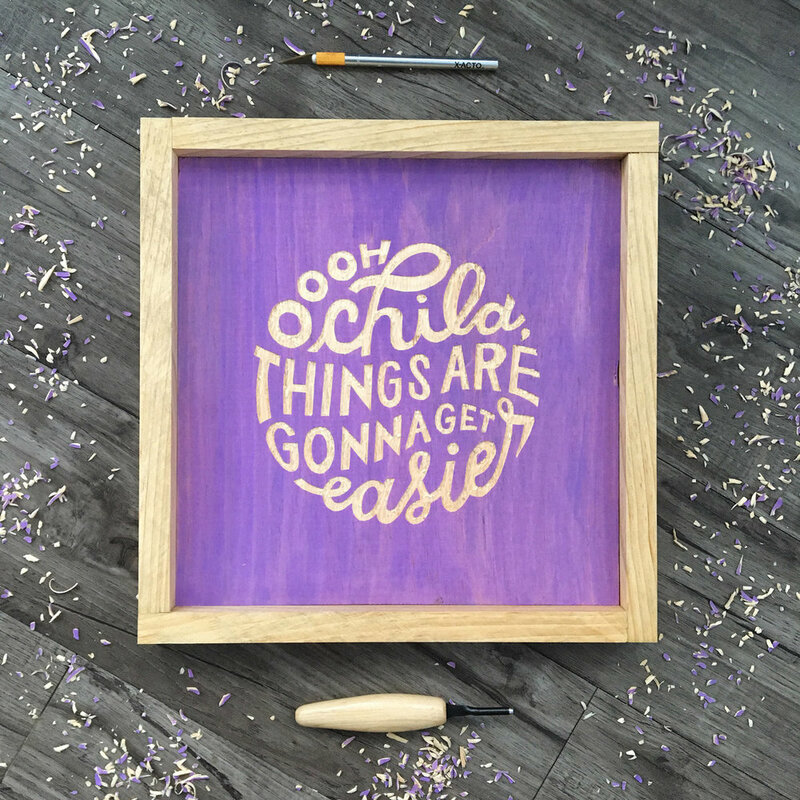 #38 - Ooh child, things are gonna get easier. I read somewhere while I was pregnant that around 30 weeks, your baby starts actively listening to your voice and that it was good to sing to them some simple melodies. I started singing this song to Smallters (that’s what we called her before we met her) because it’s simple and joyful and full of hope. Turns out it’s been just as helpful a mantra for myself, adjusting to my new life as a mom. It seems that as soon as one thing gets easier, another swoops in to make things harder, but I can keep reapplying this song to the wounds and it truly helps. It also helps that just the first couple notes of this song bring a big, wide, gleeful smile to my little girl’s face, sometimes even when she’s in the middle of crying. If you are currently pregnant, I highly recommend you pick a simple song that you like and start singing it often. Maybe one like this that will give you some encouragement too. You’ll need it. We all do. #52 - The sun will rise and we will try again. The last few weeks have been so so hard on me, and to make it worse, I’ve been equally hard on myself. We’re trying to diagnose some food sensitivities in the little one, which has me questioning every bite of food I take, and if her symptoms flare I blame myself and that broccoli I had with lunch. Keith broke his elbow recently, leaving me to do all the lifting and diapering and feeding and burping, these things we used to share. I get frustrated in the middle of the night, woken up for the third or fourth time, and I feel irrationally angry at this beautiful little being. And then I add a layer of pain on top of that, angry with myself for feeling this way. I can forgive Keith immediately when he gets frustrated with her, but I can’t do the same for myself. Self-forgiveness is oddly difficult. So I’m keeping this one on my nightstand, so that each night it’ll remind me to let go of whatever happened today so I can try again tomorrow. It’s not really much of a postmortem. It’s mostly just a bunch of disorganized reflective thoughts. I set out to do these five things: First, ward off the evil spirits of anxiety and depression; second, stop thinking about trying to get pregnant; third, be somewhat as awesome as my husband; fourth, find my unique style and build a body of work; and fifth, recharge creatively outside of my day job. I think I fulfilled all five. One, no dips into the Upside Down this year, even though I was worried about postpartum depression. I definitely had some baby blues and am up and down emotionally, but haven’t returned to that dark hole of purposelessness. Two, I stopped thinking about getting pregnant, and then got pregnant and had a child. Three, I followed through on this project, even when it was way harder after my daughter was born. I’m proud of that, although it has probably added quite a bit to my postpartum stress, but I didn’t want to feel like I had to give up a part of me just because I now have a child. Four, found my style and my medium, for sure. I’m glad I let it evolve a little bit along the way, and gave myself some space to stretch out the weekly deadlines, otherwise I may have abandoned this altogether. And fifth, I committed to making things with my hands to offset my very digital, pixel-y day job, and I think that helped both improve, although I don’t have any conclusive evidence. While on vacation in Cape Cod, I didn’t have wood glue so I used tree sap to repair a mistake. Worked like a charm, felt pretty badass. 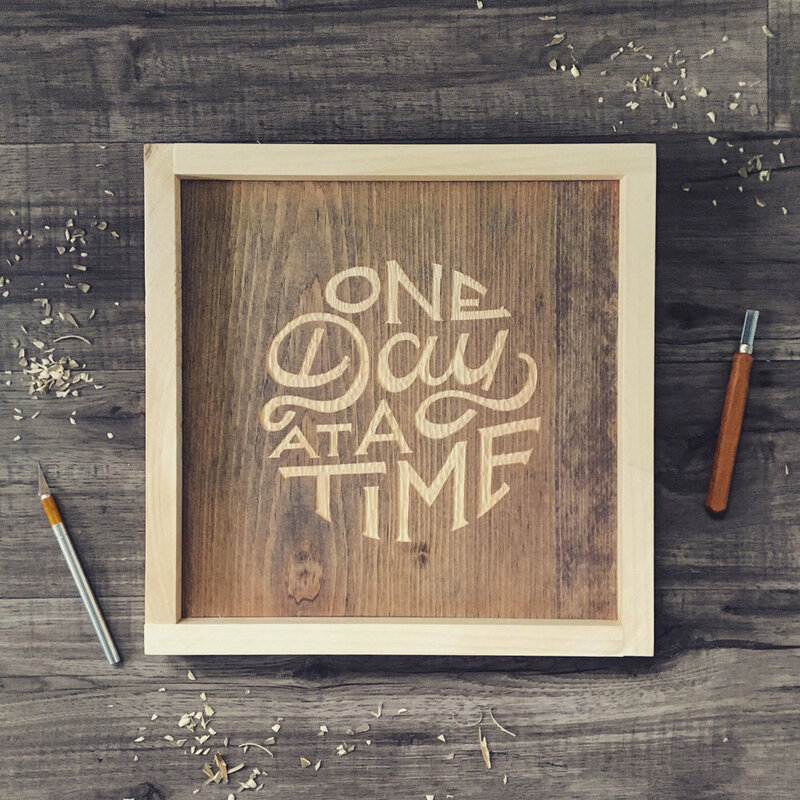 Five of these were given as wedding gifts, each carved with a lyric from the couple’s first dance. I carved three John Muir quotes, because let’s be honest, he’s the man. And two Leslie Knope quotes, because let’s be honest, she’s the woman. I carved the word life five times and I carved the words heart, sun, and love four times each. 19 of these little circles feature song lyrics. These are my top 8 favorites. For more than a year, you lived amongst little piles of wood bits and saw lots of wood purchases on our credit card statement and you never complained once. You supported and encouraged me and ooh-ed and ahh-ed at every new framed piece I brought up from the basement. You gave me time to work and tools to work with. You kept asking “what are you going to do next?” You kept me going. Thank you. My mom has always been my biggest fan, you guys. I want to be that for my little girl, too. Every time I brought one of these around her she’d say “Joanna, these would sell like hotcakes at a craft fair!” One day she and I will start a crafty business together. Love you a bushel and a peck, Mom. I grew up watching you support and encourage Mom with her craftiness, from picking up her favorite hard-to-find sewing machine and kitchen mixer models at garage sales to working on building her a little stained glass workspace in the basement. I’m glad Keith encourages me in the same way you encourage her. Love you to the moon, Dad. Thank you for your taps and comments and your opinions and advisement and ideas and support and your lovely, lovely eyeballs witnessing my work. It’s so cool to be able to put things you make out there in a minute for everyone to see and I’ve never felt anything but love from you all. I’m truly grateful. Thank you for offering a class on woodcut printmaking and for offering classes to inspire people all over the area in all kinds of subject matters. And to the instructor whose name I can’t locate, thanks for peering over my shoulder at my notebook with bright eyes and curiosity - I’ll never forget that. We raised more than $1400 for some sweet organizations together. You helped me use this art to make a difference, and for that I am extremely grateful. Thank you. Some of you just straight up bought these from me, instead of making a donation. I am so grateful for that too. I put most of that money back into this project, buying materials and tools to keep going. You helped me find the circles! I never told you this but when you asked me to design a t-shirt to give to prospective Geneseo students, and I decided to cram “There’s no place like here” into a circle, that was my first romance with type in a circle. Even though those shirts didn’t get printed, I consider that one of my most worthwhile projects. And thank you for lovingly displaying my Sara B circle in your beautiful home, friend. For the crazy gorgeous wood scraps you gifted me before this whole thing started - thank you. One of my favorite gifts ever, honestly. You were with me through every single one of these. Thank you for enduring lots of loud noises from saws and nail guns and never flinching once. Thank you for inspiring many of these and teaching me some tough lessons. Thank you for the smile you greet me with every morning that helps me erase my failings and frustrations from the day prior. You, my dear, are my most amazing creation. You didn’t think I’d give these up so quick did you?! I’ll always love this form and I’ll never stop making these. I am not opposed to recreating any of the pieces above. It’d be like visiting an old friend. I’ll offer a few remakes here and there as time permits! I made a special illustration of Letchworth State Park (pictured above) for Keith for Christmas this year and I’d love to carve out some more landscapes and illustrative designs. I hit pause on a lot of commission work so that I could get this project finished, and I do have a line of commissions to work on once I wrap this recap, but I’ll be opening up for some more commission work soon. I got some relief printmaking supplies for Christmas (thanks Mom!) and there’s some gold metallic ink that I can’t wait to play around with. A few quotes that I absolutely love just wouldn’t fit nicely into a circle, so I’m going to break out of the circle and the square and make some bigger rectangular pieces. A couple of the commission requests I’ve gotten already are for some interesting things that I never would have thought to make. Stay tuned for some weird shapes out of my workshop! If you’d like to keep up with my upcoming shenanigans, follow me on Instagram. If you’ve made it all the way down here, my goodness, bless your soul. Thank you. Sincerely. Thank you. Here is a very cute picture of my dog and my child as a reward. Below is a form you can use to contact me if you’re interested in commissions or collaborations or want to drop a line about anything, and I mean anything at all. I’m an open book about any of the tough subjects I touched on and I’d be happy to go into more detail or to hear about your experience, even if it’s just a quick “me too”. Or maybe you’re starting your own 52 week project and want some encouragement. I will be your biggest fan and your most vocal supporter. Whatever it is, I’m here for you.